We're just gonna come out and say it: BIC has made a line of pink pens called BIC for Her. Please take a moment to react appropriately and maybe text your mom about it. Now, you've got three options for lady pens: Cristal for Her features a thin barrel (available in your fave colors) for "better handling for women"; BIC for Her Ball Pen has a "fun comfort grip"; and, the BIC for Her Gel Pen has no exciting features other than it's a gel pen and will make you nostalgic for those schoolgirl-note-passing days. This is obviously sexist, and while we've managed to get it through our pea-sized woman brains that these are not pregnancy tests, we've gotten a great chuckle at the 15+ pages of product reviews from the U.K. Perhaps unsurprisingly, reviewers opted for flights of sarcastic fancy rather than indulging in anti-sexism tirades. Of course, there is the obligatory outraged customer, but for the most part, the responses are chock-full of dry humor. Too bad the BIC for Her line is currently only available in Europe. In the meantime, read our top seven (you try picking just five) Amazon product reviews. For added fun, read comments aloud in your most affected British accent. "I bought this pen (in error, evidently) to write my reports of each day's tree felling activities in my job as a lumberjack. It is no good. It slips from between my calloused, gnarly fingers like a gossamer thread gently descending to earth between two giant redwood trunks." "I tried these on a whim, and I have to say I wasn't very impressed. The applicator mechanism is far too fiddly, and the plastic tampon inside far too thin (not to mention uncomfortable and non-absorbent) -- I'm sure there must be a knack to using them, but I couldn't find it. They also stained my knickers blue for some reason." ★★★☆☆ Mrs. J. Willis "Jane W"
"……… I really can't work out what to do with this product. It doesn't seem to work at all. Where am I supposed to put the batteries?" "These are absolutely rubbish at hair removal. Would not buy again. Now my legs and pits are really overgrown and I'm worried everyone will think I'm a feminist." ★☆☆☆☆ Kirsten T. Elliott "jessiethecat"
"I think this item is extremely sexist. As a straight woman with loads of gay friends who are proud to be pink, I think the description of a pink pen as being for women is offensive to them. And what about all the women who hate pink? BIC should be ashamed." "With my special 'woman's hands', made useless as a geisha's feet with carbuncled rings and glittery acrylic nails, I have found the perfectprettypinkpuffballpen. Soft-as-swansdown and scented like kitten-wee (kittens force-fed-violet-and-rose-creams-like-veal), my joined-up-writing now benefits from daisies dotting the i's and love-hearts for full stops. 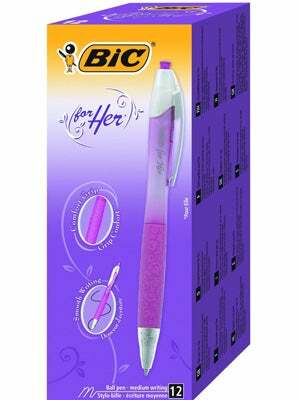 My literary life would be made perfect if BIC could now invent a pen that doesn't even touch my petal skin but hovers in my lilac-stroking, Flake-posting paws like the badly-drawn butterflies that hover over my much-practised-yet-effortless-signature. XXXXXX"